This is the third book in the Last Chronicles of Thomas Covenant and the ninth – and penultimate – Thomas Covenant book overall. It follows on directly from Fatal Revenant, where – look away now if you don’t want to know the result – Thomas Covenant, having died ten years previously his real world and three millennia ago in the world of the Land and become part of the Arch of Time, was resurrected by his lover Linden Avery, thus rousing the Worm of the World’s End and dooming the world to destruction and ensuring Lord Foul the Despiser’s swift release from his imprisonment within the Arch of Time. This climactic scene takes place within the numinous region of Andelain, where the dead are able to appear to advise their living friends, and continues into the next book – for five long chapters – as the assembled heroes of the Land’s past and future debate what to do. In addition to debating what to do, Covenant in the first chapter and Linden in the succeeding ones agonise over the consequences of their decisions and their inability to deal with them. This agonising is a huge feature of Donaldson’s work, especially in these Last Chronicles, and, while I love Donaldson’s work in general, has been a big stumbling block to my enjoyment of this book and the first in the series, The Runes of the Earth. It starts off tedious and doesn’t let up much. Fortunately, once Linden makes up her mind what to do, there is also a fair amount of action. Strangely, though, given that the world is going to be destroyed in a few days as the Worm of the World’s End ravages its way across the Earth devouring Earthpower, the characters all acknowledge their inability to do anything about it and instead concentrate on rescuing Linden’s adopted son, Jeremiah, a boy without volition or speech but with the mysterious ability to construct, um, constructs that open portals to other places. Against All Things Ending is really his story – even though he isn’t present for a large portion of it, and is unable to do anything because of his mental state and other factors. As with the other books in this series, the volume is divided into two parts, and each one is very similar in terms of pacing. Each begins with a long section of discussion and inner turmoil and ends with with some profoundly momentous questing and action. By the end of the book, although certain obvious things have been achieved, there are still the same potent dangers looming in the immediate future – this volume even adds another, as if the Worm, Lord Foul, Kastenessen and his skurj Roger Covenant (Thomas’s evil son), two ravers, a pack of semi-evil sandgorgons roaming the Land etc weren’t enough to be going on with. This means that there are an awful lot subplots to be drawn together in the last book – The Last Dark. Infelice shed distress like damaged jewels. Wreathed around her limbs, her bedizened garment resembled weeping woven of gemstones and recrimination. At once, Infelice fled like a wail from the hollow. Around Linden, the wan glitter of starlight lay like immanence on the friable crust. Cold and scalding as congealed fire, the flat wilderland ached towards its illimitable horizons. 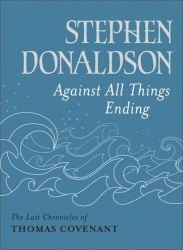 While I admire Donaldson’s determination to write something that is dense and difficult – qualities that are reflections of the density and difficulty of the characters, story and world they describe – his lexical tapestry in this series does verge on the ridiculous. These two massively important elements of The Last Chronicles – the endless inner turmoil and torment of Covenant and especially Linden (who is the much more prominent character in the three books), and the complex and grandiloquent language – both tend to detract from the emotional impact of the work. And these books should have vast emotional impact: Linden is trying to rescue her son and, in doing so, in trying to follow cryptic advice from Covenant and others, in trying to balance the needs of her companions, she dooms the world to destruction. The inactivity of the characters for large portions of the book – in the face of imminent death – is also annoying. Still, the uniqueness of the series and the author’s style of writing in the series are things that should be savoured. This is not literatures for juvenile minds, it’s not intended to be a happy jaunt through fantasy land, but is supposed to be difficult, harrowing, challenging. Instead of a plastic, superficial attractiveness, Donaldson is attempting to create something of lasting and genuine beauty. It’s just a shame that he seems to overdo it so much. 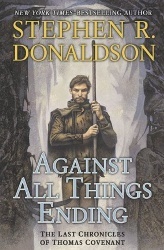 I still enjoyed Against All Things Ending, but it wasn’t as good as the preceeding installment; I found it on a par with The Runes of the Earth. Only three years to wait for the last ever Thomas Covenant book. 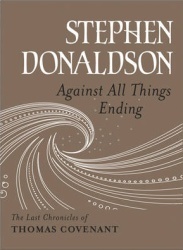 You’ve answered a couple of questions lately about the cover art of the upcoming US edition of Against All Things Ending, but I was wondering what your thoughts on the UK edition were. It seems to me it’s not as mysterious as the previous two – it’s too clean – almost happy. But I do like the continuation of the elemental theme – forest, mountain, sea. And I much prefer the less representative, more oblique approach of the UK covers. In general, I prefer the UK approach rather than the US one. And in general, I don’t think that the UK “Against All Things Ending” is up to the standard of the previous two books. But have you seen the “revised” UK cover? I’m told that the unrevised version (before both my agent and I screamed) is still floating around on the web somewhere. It makes the book look like a box of laundry detergent. By *that* standard, the revised cover is a huge improvement.